Counsel: J. Hessing-Lewis, Skunkworks Creative Group Inc.
How law firms compete in search engine results (search engine optimization or “SEO”) extends lawyers and law firm managers well beyond their professional comfort and interest. Intuitively, they know that it matters for their business. Beyond that, they are lost in a sea of jargon and uncertain costs, problems with which the legal community may be familiar. This article aims to translate the essence of SEO strategy into legalese, mutatis mutandis. Always start with why your law firm should care? In other words, why does SEO matter? Is it a matter of sustaining existing legal practices, growing the business, competitive instincts, or reputational pride? First up, you can only manage expectations and evaluate results if you have established a business case. Search results on Google are highly competitive zero-sum real estate and lawyers must understand what kind of results can be expected for their practice. If a firm is looking to grow, expectations should be based on incoming files. If you simply want to outrank certain competitors, that may require an altogether different strategy. What a firm should ultimately expect will depend on the practice areas and regional market. To get a sense of this picture, you’ll need to know where your firm currently stands. In other words, you need to get a handle on your baseline or benchmark data if you are going to accurately measure the effectiveness of any strategy you employ. This information is also useful for fending off the inevitable calls from snake oil sales people who tell you that they “did a Google search” for your firm and raise alarm bells about their findings. You can’t tell if they are blowing smoke or if there really is a fire unless you understand your own position. Search result layouts are presented differently across devices and this landscape will continue to change as new search technologies emerge (e.g., voice search) and search engines are pressured to increase revenues. Search results are a business unto themselves. Know that search results you are seeing are highly contextual and not a de facto reflection of where your law firm ranks on average. You will see results according to your specific search query syntax, location, device, search history, network connection, and a multitude of other factors. Simply put, there is no “single” Google search that reveals all – see note about snake oil above. Marketing agencies use specialized tools to track average performance against competitors and how these rankings fluctuate. Determining what keywords and phrases that prospective clients are actually searching is half the battle. An SEO audit is a good place to start if you want to establish benchmarks. The usual principle applies: “If it matters, measure it.” You will need to identify a list of priority search terms/keywords that matter to your firm’s practice areas. This helps formalize client expectations as well as improves measuring effectiveness over time. Search results contain a number of components, including paid ads, business listings, and organic search results. In addition, the trend on Google is to deliver actual answers to queries rather than just links to websites. 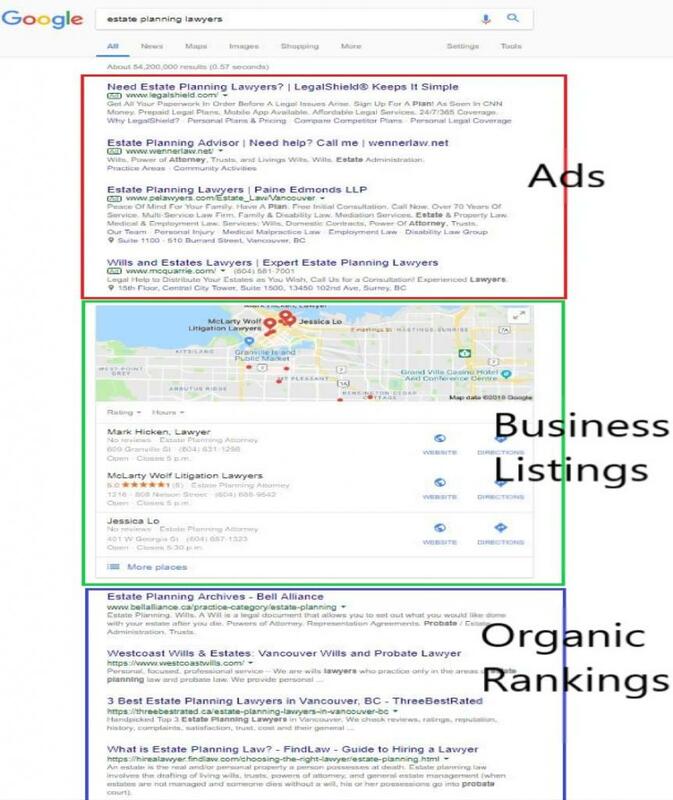 Lawyers should recognize that the top search results are generally pay-to-play Google Ads. When it comes to search queries for law firms, people may or may not care whether they are clicking on an ad. Google Ad campaigns operate on a complex auction model where ad position is determined according to bids and the relevance of keywords to the website. 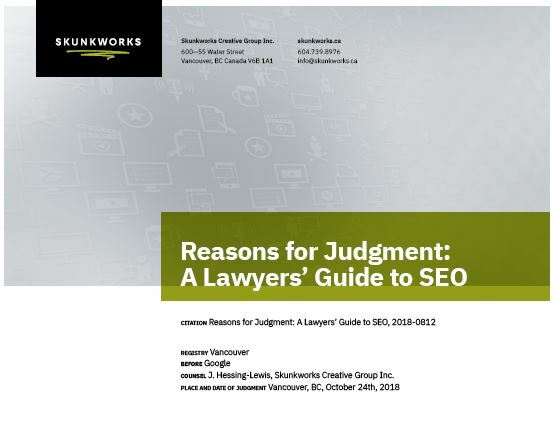 With the cost of a single law-related click running anywhere between $2 and $180 in Canada, law firms should obtain specialized advice from consultants experienced in legal marketing who are familiar with relevant practice areas and Law Society marketing rules before committing to ad campaigns. While paid ads can be part of a comprehensive marketing strategy, both Google Business listings and Google Ads (Search (Adwords) and Display) are beyond the scope of this article. Our focus in this blog post is on the organic rankings or where your website sits in page rank based on its structure and content. See the graphic below that shows the various parts of a search results page. The issue with “pay-to-play” vehicles, like Google Ads, is that if you stop paying you disappear from the search results. Or, if you are in a highly competitive practice area, like personal injury law for example, you may not appear at all if you are outbid by firms who invest tens of thousands of dollars a month (yes you read that right) to make sure they capture the top keywords and search terms for the practice area. Even if you plan on outsourcing as much as possible, the first two will help you evaluate who you should hire for the work and whether their recommendations are appropriate for a law firm in a regulated professional context. Other than the Primary Sources referenced above, Google does not actually tell lawyers how to improve their visibility in search results. This void is filled by an industry of marketing consultants of varying degrees of respectability. SEO consulting advice commonly mixes the verifiability of religion with the jargon of a mechanic and the promises of miracle diets. Secondary sources tend to be distractions from the first principles described above. Most quick technical fixes tend to have short term effects at best. Like a fashion fad, any herd movement amongst marketers will have the effect of reducing the value of any particular strategy. Where secondary sources can be useful is in assessing the qualifications of a service provider. SEO providers range from reputable agencies and freelancers, to dubious phishing schemes that you have almost certainly encountered in your inbox. Beware promises regarding getting you to the 1st page of Google or other ranking guarantees, all of which will be ultra vires for legitimate marketing consultants. My SEO advice always starts from the first principles of search engine rankings. While Google’s ranking algorithms currently include thousands of indicators (Google does not disclose how these indicators are weighted relative to one another), the fundamentals follow legal research – relevance of a legal decision is weighted according to both the content of the decision and citations to the decision. Google was not the first search engine. It was, however, the first to use citations as a determinant of relevance. maybe they are more cited because they are more cited. To determine the relevance of a single decision, I would a) review the decision itself and b) note-up the decision to see where it had been cited. As applied to SEO, a website’s search performance will be a reflection of a) the content on your website and b) the links pointing to your website. This is where the heavy lifting of SEO work occurs. There are technical aspects that will allow search engine crawlers to properly review the content on your website. This includes ensuring that crawlers will be able to perceive a hierarchy of relevance in which some “cornerstone content” offers insights into the priorities of the firm. Selecting these topics requires thinking through the firm’s business strategy as well a identifying subject that matter the most to prospective clients. Google wants to see a logical funnel for the client’s experience rather than a vast, horizontal firehose of content. Even a perfectly formatted website (from a technical perspective) will always be at the mercy of content. Search engine crawlers are looking for content that reveals a nexus between when someone searches for “Personal Injury Lawyer in Vancouver,” for example, and a website that matches the user’s intentions. The content on your website will be filtered through thousands of data points, but all of them are trying to match what a human user would see as relevant. It is quantitative algorithm doing its best with qualitative questions. Google repeatedly emphasizes that website owners should focus on content that caters to readers (humans) rather than search crawlers. Accordingly, there is little point trying to game the system with a jumble of “SEO-Friendly” keywords. Because lawyers should ultimately be responsible for content on their website, this raises the journalistic question of whether lawyers should be writing the content that people want (“Free Consultations”) or the content that people need (“Here is How Contingency Fee Agreements Work…”). For particularly competitive practice areas in bigger markets, the answer is simple: you do both. Content alone will not guarantee a competitive ranking for your law firm’s website. Google wants to see that other people also think it is important. In this case, importance is reflected through links (citations) back to your content. While the content itself is generally what drives these back-links, there are SEO strategies that can encourage others to link to your site. The brilliance of modern search algorithms is that these back-links are not equally weighted. The value of each link will depend upon the website doing the linking. 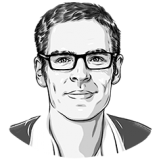 A link from the New York Times is of far greater value than a link from your aunt’s blog. For law firms, the most valuable linking websites will tend to be mainstream media outlets. This means that good SEO, when it comes to linking, is not very different from good public relations. For example, being interviewed on the CBC as a legal subject matter expert may have far more SEO value than a dozen blog posts. Of course the trick is that they often feed each other. You become the subject matter expert by writing the blog posts. A journalist then bases your qualifications on the content piece. Google sees both the website content and the incoming links from reputable sources. From a marketer’s perspective, these links can be quantified by noting-up. We use specialized SEO tools to monitor both the sources of these incoming links as well as the value of each link. I find that most lawyers will be attracted to the idea that the ever-changing whims of Google SEO can be distilled into a general proxy for relevance that remains firmly rooted in the content of a website and the links/citations to the website. If only Google offered a legal case law search engine. While this explains search results post facto, it lacks prescriptive advice on how lawyers and law firm managers can improve their organic rankings. Therein lies a similar distinction: between legal information and legal advice. The former is free, the latter costs money. At Skunkworks, SEO efforts are viewed as part of comprehensive marketing efforts and are not delivered as a stand-alone service. A law firm’s website, its social media efforts, its paid search and display campaigns, its interactions with former clients and referral partners, its public events, its promotional items, and various emerging platforms, all work together to attract new business. Good marketing remains the result of hard work, by a team of people, over a longer time. If your firm is interested in hearing what Skunkworks can do for you, let us know.